The state Public Utilities Commission gave its unanimous blessing today to an energy purchase agreement that clears the way for construction of a 305-megawatt power plant in Otay Mesa. The 5-0 vote by the CPUC approves a 25-year deal between San Diego Gas & Electric and the Pio Pico Energy Center. 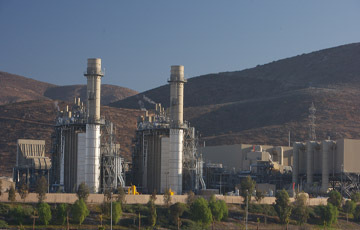 Otay Mesa Plant. Photo courtesy Calpine. Terms calls for the plant to be functional by Sept. 1 next year, with the flow of electricity to SDG&E starting in 2017. Until then, Pio Pico will be considered a merchant generator, selling on the wholesale market, CPUC President Michael Peevey said. Peevey said the plant was “a critical piece to the puzzle” of replacing the retired San Onofre Nuclear Generating Station. A previous purchase agreement between the utility and power plant operators, with different terms, was rejected by the commission. Peevey said he urged them to return with a plan that fit the need to fill the nuclear void. Environmentalists opposed the plant, contending the loss of supply from San Onofre should be filled by renewable sources. According to the coalition, the plant will create more pollution in the South Bay, put ratepayers on the hook for at least $1.6 billion and have a detrimental impact on climate change.